A fireball spawned by the Leonid meteor shower takes center stage in this NASA handout. You can watch the famous November Leonid meteor shower rain down live, regardless of your area's viewing conditions, thanks to the Slooh Community Observatory's online webcast tonight (Nov. 16), which will also feature a discussion of the shower's history and mythology. Slooh will start the show at 8 p.m. EST (1 a.m. GMT), and you can view the broadcast here on Space.com. The webcast will show live meteor feeds from Slooh's observatory at the Institute of Astrophysics of the Canary Islands. Live streams also will be available from the United Kingdom and Slooh's headquarters in Connecticut. While showing live views of the meteor shower, scientists at Slooh will discuss how the Leonids occasionally produce a huge outburst of meteors. The most famous such outburst took place in 1833, when viewers in eastern North America saw as many as 200,000 meteors per hour for 4 hours. This NASA sky map shows the location of the Leonid meteor shower during its peak at 2 a.m. your local time on Nov. 17, 2016. 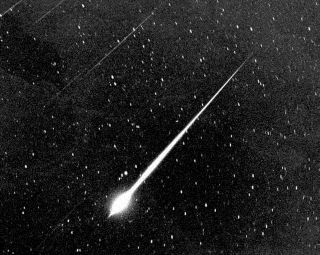 "The meteors came so quickly during this 1833 storm, it was clear the radiant, or apparent source, of the meteors lay towards the sickle of the constellation Leo," Slooh representatives noted in a statement. "The radiant moved with the stars during the evening, which finally made it clear that meteors came from outside the Earth's atmosphere. Until then, some believed meteors were an atmospheric phenomenon," which is why the term "meteorology" refers to the study of weather, they added. Viewers can send their Leonid meteor shower photos or ask questions on Twitter by tweeting at @Slooh, or participate in the live chats on Facebook and Slooh.com. Editor's note: If you snap an amazing Leonid meteor shower photo you'd like to share with Space.com and our news partners for a possible story or image gallery, please send your photos to our staff at spacephotos@space.com.